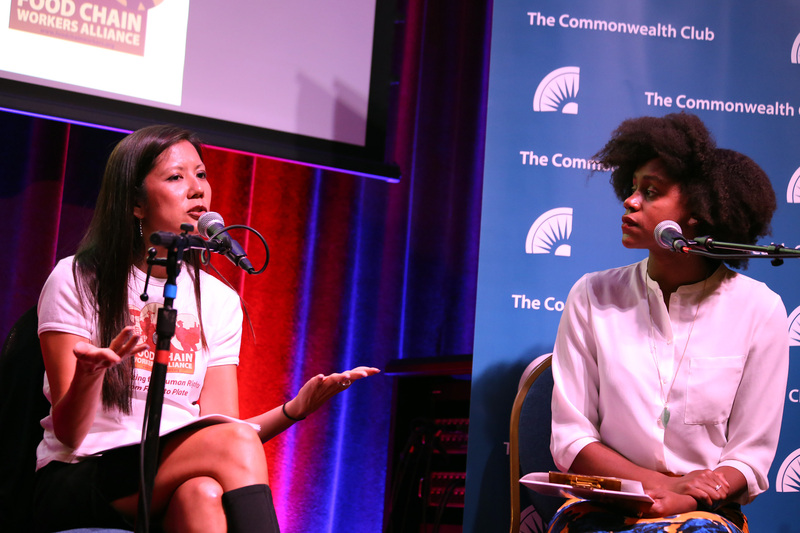 A farmer, a restaurant owner, a labor supporter and a public-health community advocate walk into a room over a bar...and they're greeted like rock stars by a sold-out crowd. 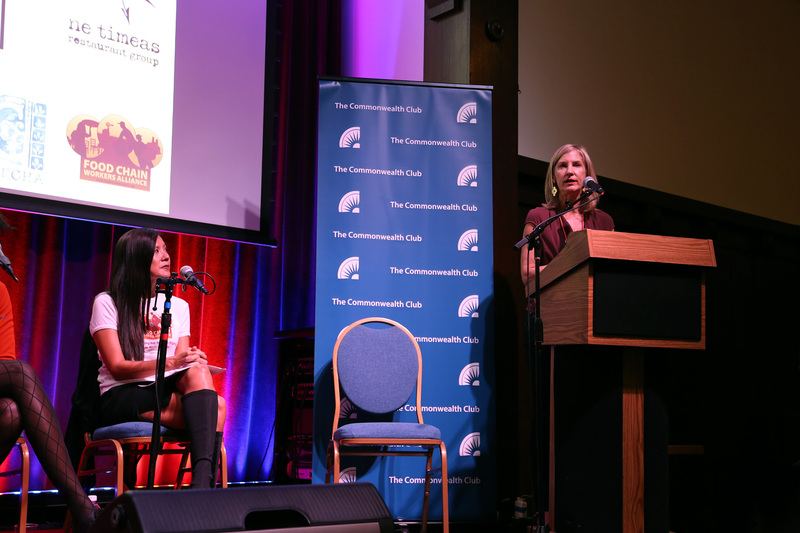 This was the scene at the Swedish American Hall on Monday night, August 15, when San Francisco's Commonwealth Club presented Women Leaders at the Table: Addressing Inequity in the Good Food Movement. 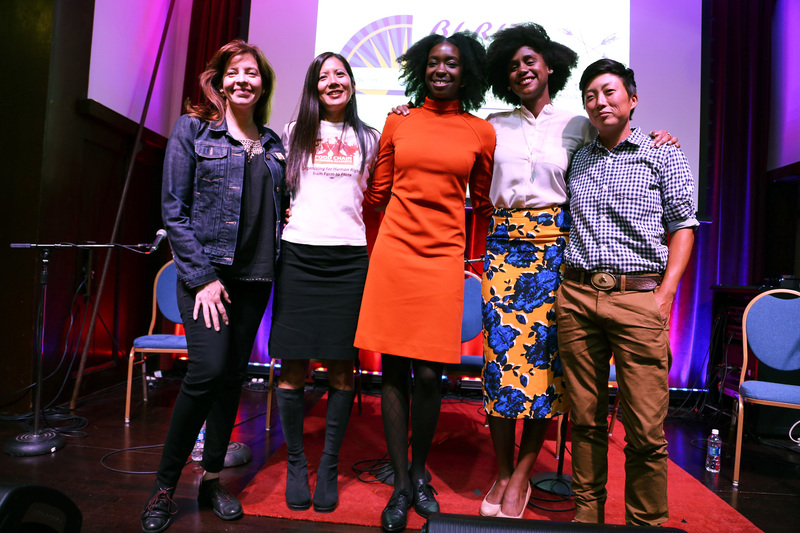 When Cathy Curtis, the organizer of the Commonwealth Club's Food Matters program (formerly Bay Gourmet), began to put together a panel of women of color to address issues of inequity and race in the good-food movement, she had no idea it would draw such a crowd. 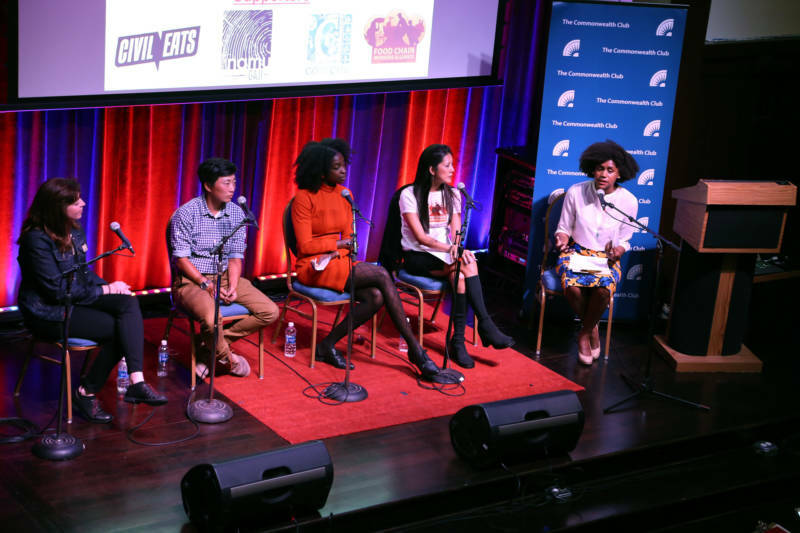 Initially, the panel was set to take place in a small meeting room within the club, but once posted, the event sold out almost immediately, and Curtis and the panel's moderator, Shakirah Simley, were flooded with emails begging them to shift the event to a larger venue. After a last-minute scramble, the Ne Timeas restaurant group, which owns Aatxe in the Swedish American Hall (as well as Cafe du Nord next door), offered free use of the hall's large meeting room upstairs. 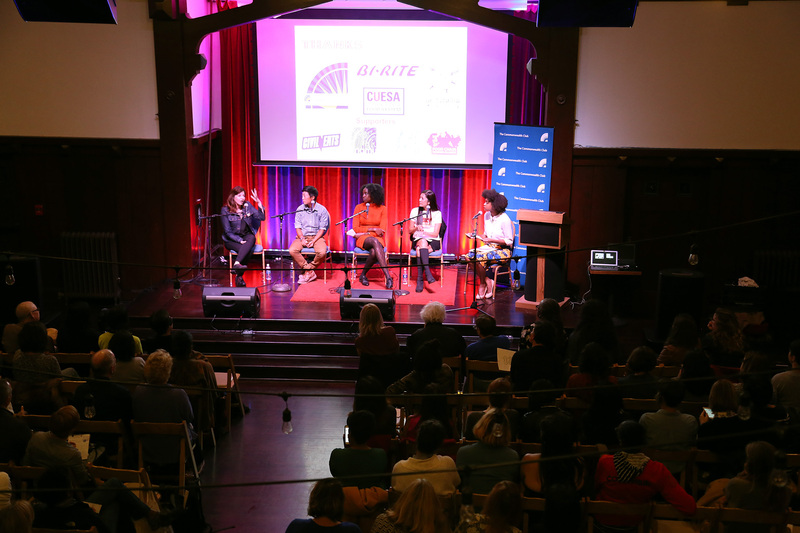 Civil Eats offered media support; CUESA pulled in volunteers; Bi-Rite Market donated wine and sandwiches for the post-meeting reception. By 7pm, the room was filled to capacity. This was not a meeting preaching the hazards of Big Food or Big Ag to the already-converted (although there were plenty of finger-snapping moments of approval), but rather an insightful dissection of some of the assumptions and privileges within the movement for "good, clean, fair" food, from the racial complications of soda taxes to the implications, benefits, and repercussions of direct action, from Black Brunch to the push for higher minimum wages across the state. 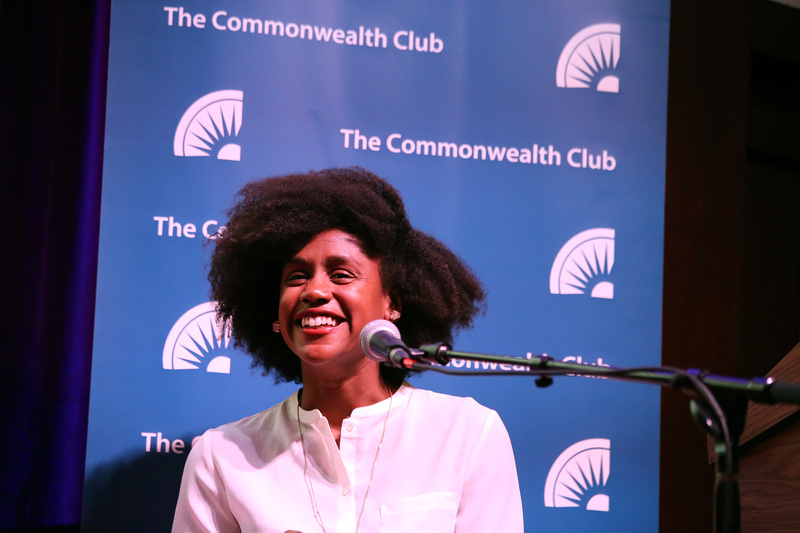 In her introduction, Curtis urged attendees to look not just at "what's on the plate, but who's sitting at the table," as we work towards creating a more equitable good food movement. This isn't as easy as it sounds; when asked about how her work as a public health advocate, particularly among urban African-American communities, connects with the good food movement, Brittni Chicuata stated, "When I think of the good food movement, or the slow food movement, or when a lot of folks think of it, it's 'that's bougie and inaccessible and not for me.'" What matters to Chicuata is helping communities face, and overcome, what they (and she) see as systemic barriers to living healthy lives. In other words, it's less about the kale, and more about transportation, education, labor, the history of zoning laws, and the history of red-lining by banks that kept business loans out of low-income neighborhoods, says Chicuata, who grew up in the Fillmore and now lives in Oakland. Although, of course, the kale--or in this case, the shiso leaves and hot peppers--have to come from somewhere, and small-scale, sustainable farming is at the heart of the good food movement. At Namu Farm, Kristyn Leach describes her acre-and-a-half parcel of land in the Sunol Ag Park as an experiment in "really kind of crazy and strange" farming, with an emphasis on very slow, deliberate practices of carbon-sequestering, no-till cultivation with rotating cover crops, inspired by both permaculture and traditional Asian farming techniques. Said Leach, "I became a farmer because it's a really direct way to care for the people around me," and be a responsible steward of the land. For business owner Dominica Rice Cisneros, whose downtown Oakland Cosecha Cafe is celebrating its 5th anniversary this week, being part of the good food movement meant helping to revitalize the part of Oakland where she lived, by opening a family-friendly cafe in the Swan's Market, and, as a small business, creating jobs that respect and reward the skills of women in her community. (She hires men, too, but her tortilla-making morning kitchen crew is all female.) "We don't just sell tacos, we sell peace of mind. You bring your family to us, we're going to take care of them," said Cisneros. But what happens when different communities see "good food" in different ways? What happens when attempts at intersectionality come across more like bossiness, interference, or tokenism? As a public health advocate who sees people suffering every day with preventable diseases, Chicuata is a vocal proponent of soda taxes. She's no fan of the savvy strategies that big soda corporations use to protect their markets and promote their products in historically underfunded cities like Richmond, CA. But she also sees the willingness of some advocacy groups to call out communities of color around these issues as "bad campaigning" that weakens everyone. 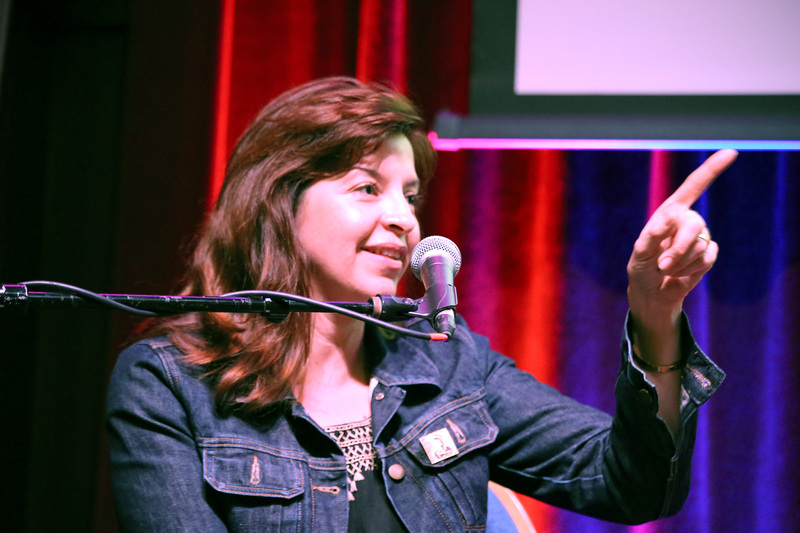 "When folks of color, as stakeholders, are not at the table, and are only tokenized at the 25th hour to be your messenger, it doesn't work," said Chicuata. "We need to be at the table making decisions about how the policy is written, how that money is coming back into the community, and what our outreach strategy is going to be. I can't just come help you when you have made all the decisions." Food activists who want to bring workers' issues, like livable wages and better working conditions, into the public eye can learn from the labor movement's emphasis on direct action, said Lo. Forging connections across communities can also break down isolation and help workers learn to speak up for themselves, and for each other. 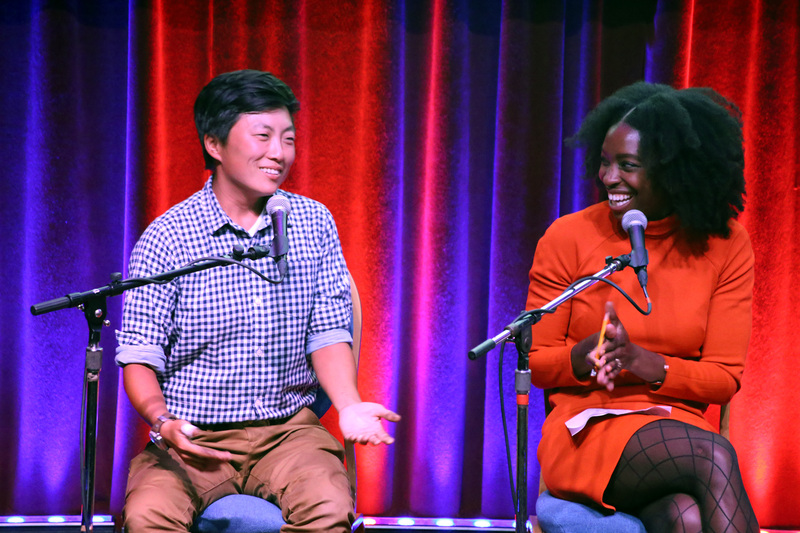 "It's really important for us to develop leadership among workers, including women, people of color, immigrants...[for them to] share their stories, to feel connected. 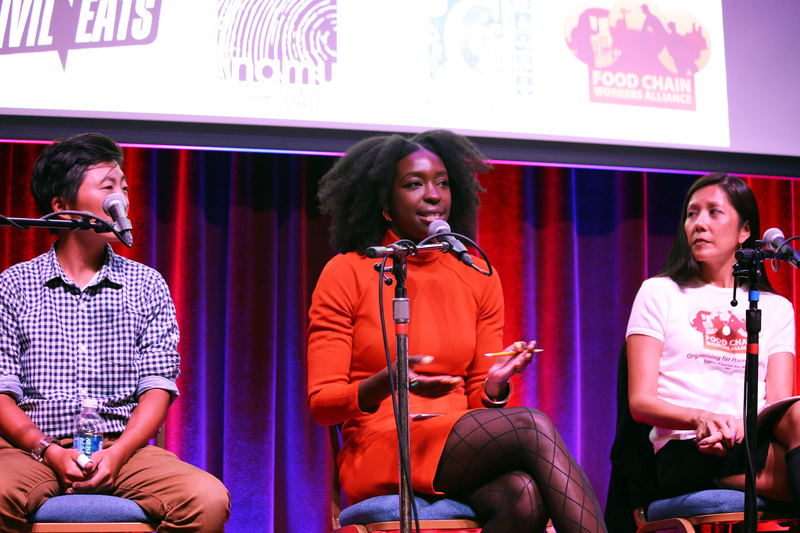 These workers are often invisible to most people, to most eaters, but we rely on them and their stories are important," said Lo, who has worked with Story Corps and Real Food Media on Voices of the Food Chain, a series of videos focusing on issues faced by farm and food workers. Asked who else should be at the table, and whose contributions should be lifted up and acknowledged, Leach responded, "Farmers and grandmas, not mutually exclusive." For Cisneros, it's the "moms, moms and grandmas," while Chicuata pressed for more recognition and dignity, for family caretakers and farmworkers, and Simley acknowledged the contributions of young activists. Food justice is social justice, these women agreed, and there's room for everyone at the table.